The Skoda Karoq looks worlds apart from the Yeti, with all the quirkiness of the latter gone for good! Skoda has finally revealed the much awaited replacement of the Yeti, the Karoq, in Stockholm, Sweden, yesterday. 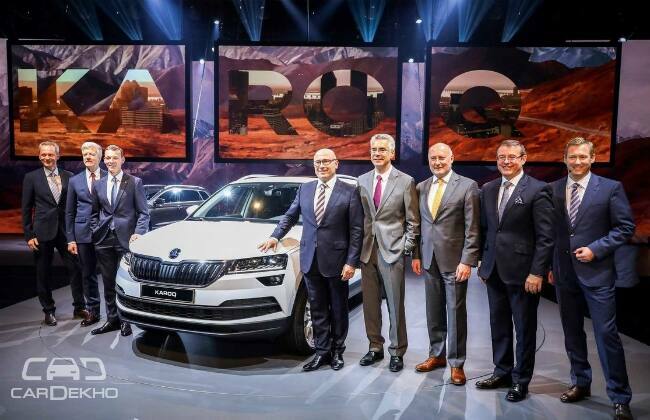 The Karoq's European sales will commence in the second half of this year, while its Indian debut is expected to happen in 2018. It will sit below the Kodiaq (Skoda’s flagship SUV), which is launching soon, in India, and will take on the likes of the Jeep Compass, VW Tiguan, Hyundai Tucson, Honda CR-V, among others. If there’s one auto conglomerate in the world, which is gaining pretty well through its synergies, it is Volkswagen Group. Platforms, infotainment systems and powertrain options, all of which are extremely competitive and state-of-the-art, are being shared across the group's several European brands, including Skoda and VW. It is just the basic essence of a particular brand that reflects through their vehicles, the rest is common and shared. In this case, it is Skoda. Apart from the Karoq's design, rest of the elements are shared with vehicles from VW, Seat and Audi. Let us see what tricks this India-bound Skoda Yeti replacement has up its sleeves. Its overall silhouette is indicative of a clear departure from the Yeti’s design. The latter’s quirkiness has absolutely vanished and in comes a more mature stance, which is in line with the Kodaiq’s. Up front, it gets Skoda’s latest twin-slat grille also found in the Kodiaq. The split-headlamps (full-LED headlights are optional) are carried forward from the pre-facelift Yeti, but unlike the Kodiaq, it gets a rectangular design. Its bigger, wider lower grille is in line with Skoda’s flagship SUV as well. The sides are typical of VW Group cars with clean crisp lines. It flaunts squared wheel arches with all-around body cladding to reaffirm its SUV nature. The rear, again is Kodiaq-like, but there are subtle differences to make the two stand apart. It also gets split-wraparound ‘C’ shaped LED tail lamps (standard across the range), but only the LED light guides extend into the tailgate, unlike the big SUV. On the inside, it gets an all-digital instrument cluster, which is first for any Skoda, and it can be set to the driver’s individual preferences. This unit should be VW Group’s 12.3-inch unit, available with the new A4 and other cars in India and globally. It has an LED ambient lighting strip that runs on the upper edge of the door trims and continues around the dashboard as well. It offers 10 different colour options. Like the recent Skodas, it gets a wide range of infotainment systems from the second generation of the VW Group’s Modular Infotainment Matrix. The systems are compatible with Apple CarPlay, Android Auto and MirrorLink. It has Skoda’s Phonebox as well, which offers inductive wireless charging and couples the smartphone to the roof antenna. Like the Yeti, Skoda will offer the ‘VarioFlex’ rear seats as an option with which the boot space can be altered between 479 and 588 litres by sliding the seats backwards and forward. The seats can also be completely removed resulting in a loading capacity of 1,810 litres. The Karoq will be available with five engine options – two petrol (1.0-litre and 1.5-litre TSI) and three diesel motors (1.6-litre and 2.0-litre TDI in two states of tune) – globally with power ranging from 115PS to 190PS. India is likely to get the new 1.5-litre TSI and VW Group’s regular 2.0-litre TDI unit. The former made its debut with the Golf facelift recently (not available in India) and puts out 150PS. Speaking of the transmission options, all of its engines can be ordered with a 6-speed manual gearbox or a 7-speed DSG (dual-clutch automatic). The Karoq also features five drive modes: Normal, Sport, Eco, Individual and Snow (4x4) modes. There's an Off-Road mode as well. Stay tuned to CarDekho for more updates on the Skoda Karoq. Recommended Read: Meet The New Honda CR-V With Seven Seats And A Diesel Mill!